Oakland Raiders wide receiver Darrius Heyward-Bey pleaded no contest today to a misdemeanor DUI charge. Heyward-Bey was arrested on the Bay Bridge on April 7th. On April 7th, Heyward-Bey was pulled over at 2 a.m. on the Bay Bridge after he left a nightclub in San Francisco. It was alleged that he was speeding and weaving on the Bay Bridge, which is why he was pulled over. Prosecutors said that Heyward-Bey's blood-alcohol content was .13 percent on scene. Heyward-Bey agreed to plead no contest to the misdemeanor charge today, so that he would receive three years' probation and three months of DUI classes. Last season, Heyward-Bey led the Raiders with 64 receptions giving him a total of 965 receiving yards. 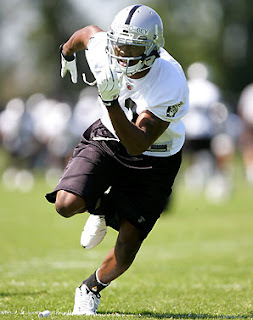 The Raiders, along with Heyward-Bey, report to Napa this Sunday for their team’s preseason training camp.